Do you like betting? Gambling on an outcome or event? I do. I haven’t wagered in quite some time but in the past I would bet money on hockey or baseball or whatever. Well this month’s movie, showing at Food ‘n Flix, is about betting on a relationship. What does the winner get? They change the direction of their career, steering it toward fullfilment (at least to them it’s a fulfilling change). But only one person can win, and neither party knows the other is involved in a wager. It’s all out war – All’s Fair in Love and War is the theme. 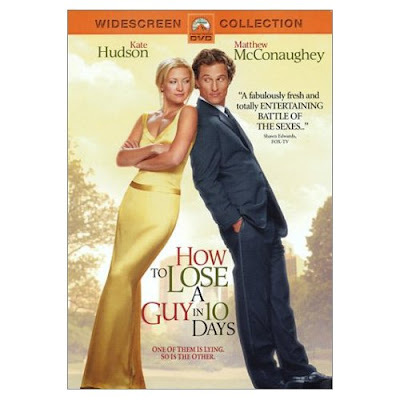 How To Lose a Guy in 10 Days stars Kate Hudson and Matthew McConaughey. It’s a fun chick flick sorta movie. Nothing deep but very amusing. Andie Anderson (Kate Hudson) is a frustrated magazine writer. At Composure magazine she writes the "How to..." articles………how to get out of a ticket, how to score free tickets to an event, etc. But this isn’t the type writing Andie wants – she wants to write about politics, economics, religion, poverty and put that Columbia education to work. In the meantime, Andie's friend Michelle has yet another breakup with her latest boyfriend and unwittingly becomes the inspiration for Andie’s next How To article. Write about Michelle’s classic mistakes in a relationship and how it drives a man off. She volunteers to write the article with a faint promise by her editor that she may then write about anything she wants. Sounds like a good deal – so now Andie is off on a pursuit to find a guy with the sole intent of driving him away within 10 days. Now, let’s introduce Benjamin Barry (played by Matthew McConaughey) who has a bet of his own to win. He works at an advertising firm and wants to score a big account in the diamond market. The ladies who usually handle the luxury type accounts trick Ben Barry to make a bet. He can have the account if he can make a woman fall in love with him in 10 days. They even pick out the woman for him – none other than Andie Anderson who is trolling around the restaurant for the guy she wants to woo and drive crazy. That’s the plot. Ben needs Andie to fall for him and Andie needs Ben to run away before 10 days go by. Which one will last? Ben walks up to her and she sizes him up. Neither Andie nor Ben reveal their true intentions. One of them is lying…so is the other! Definitely watch the movie to see how they drive one another crazy. 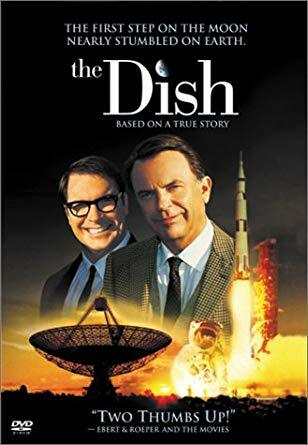 Believe it or not, but there is quite a bit of food in this movie. Right after they leave the restaurant, knowing each other for a scant 5 minutes, they share a lobster dinner and talk, flirt and get along very well. Andie: True or False: All's fair in love and war. So…food………they have a seafood dinner. Lobster and maybe some crab in there too. Funny thing is, Andie claims to be vegetarian shortly after that when Ben serves her lamb with cherry sauce. THAT looks delicious! Here she is pretending ot be upset by the lamb..."Mary had a little lamb, little lamb...."
There is a scene at a vegetarian restaurant and lots of veggie choices. While there, she ducks into the kitchen and consumes a burrito while watching a few minutes of the Knicks game. Also veggie related is the scene at Ben's poker party where a tray of veggie snacks are served. As for fast food items – there was pizza at the poker game and Chinese food delivered to Michelle’s apartment. Lots of food if you look for it....and of course, you may be inspired to make something not seen in the movie. Watch the chosen film (How to Lose a Guy in 10 Days). 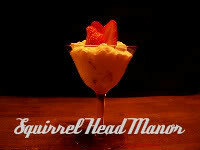 Taking inspiration from the film, head into the kitchen and cook or bake or make something. Your post must be current (during month of film). And of course we don't mind if your post is linked to other events. Indicate "Food 'n Flix Submission" in the subject line please! A good chick flick selection! I have not seen it yet. OMG! One of the funniest movies I have ever seen ... can't wait to see what you ladies do with the food inspirations!